This stylish, 37’ RV is a great option for anyone who values both comfort and style above everything else. It is great for entertaining and tow-ready in case you have a vehicle you need to take with you on your trip. So you don’t miss any of your shows, there’s the option to utilize its two satellite dishes on a “pay as you go” basis. There’s no need to pack your dishes and cookware either, since this RV has all you’ll need. 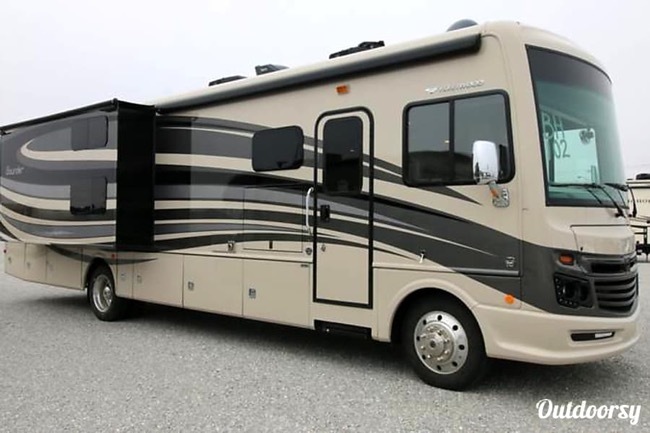 In short, this motorhome has everything you can think of, including a washer and dryer, 100-gallon water tank, heating and air conditioning, indoor and outdoor showers and a backup camera. There is even a half bath, which is convenient for families who can benefit from a second toilet. Don’t forget about Fido either; this Fleetwood Bounder is also pet-friendly. This 35’ RV sleeps 10, and Thor certainly had kids in mind when the company was designing its layout. It offers bunk beds with bed rails so the kids don’t fall out of bed. And when you need some space, the master bedroom has a door for extra privacy. Plus, it has a roomy, king-size bed. Combine that with its two a/c units, five TVs (one of which is outside) and outdoor kitchen, its family-friendly details make it feel like a home away from home. This 40’ SportsCoach is the perfect family RV that sleeps 10. With plenty of sitting room, it has two sofas and a dining area in the front salon, all separate from the two bunk beds in a separate room with its own TV. That means you can watch something before winding down for bed while the kids watch their own shows in their bunks. Altogether, there is a total of 5 TVs, including the one outside. Throw in the extra outdoor refrigerator, and this SportsCoach is a tailgater’s dream. It also has a tow hitch for pulling your car behind you. This 38’ Jayco Precept has storage galore, and plenty of special touches to make it look like home. Plenty of windows let the sunlight into the open floor plan. Just a few of the amenities offered include four slide-outs, a private bedroom with its own bathroom, a separate bath, fully-stocked kitchen and a drop-down bunk over where the driver and passenger sit. It sleeps 10 comfortably, and the owners of this Jayco will also allow you to take your pet along with you. The choices Outdoorsy has to offer allows you to pick and choose from a variety of styles and sizes to suit your travel needs. The website also makes it easy to search by price, amount of guests, amenities and location. And since the nightly rate is as affordable as a hotel, you can afford to rent a different RV every year instead of committing to just one.